This intuitive and affordable software is an ideal inventory management solution for small businesses. Easily manage movements, purchases and sales with one integrated package. Features include: stock control, serial number tracking, contact management, purchasing with the creation of detailed purchase orders from top level assemblies, purchase receipts, accounts payable, sales orders, shipping and accounts receivable. Manage multiple vendors for common items, tracking order history and item cost. Control sell price with specific markups with up to six custom pricing fields. DCS Inventory addresses the needs of several different industries including: machine shops, electronics, clothing, mechanical assembly, food, medical, aeronautical, and hotel maintenance. An important feature with an inventory control package is that it needs to be easy to use. Management and other users need to do their job without the additional hassle of learning complicated programs. The main goal of the business is to make money by selling your product not managing the software. This system allows quick access to the most common inventory control functions which makes this product easy to manage and lowers overall operational costs. 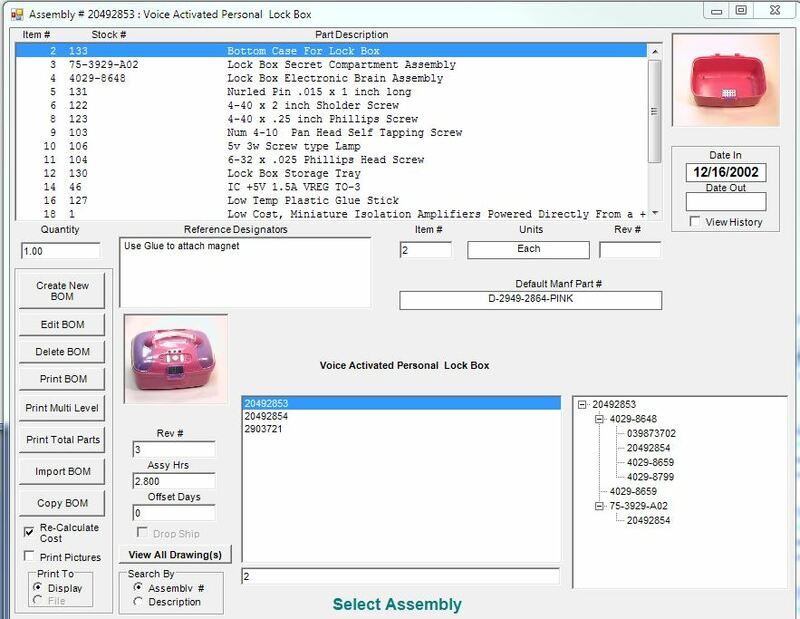 Simple visual verification of each part is what sets this inventory management apart from the competition. A picture of the part allows users to visually verify they are working with the correct part. With the picture and barcode together you will be assured that the correct part is always selected. The context sensitive search engine in this software enables users to correct part number errors in seconds. 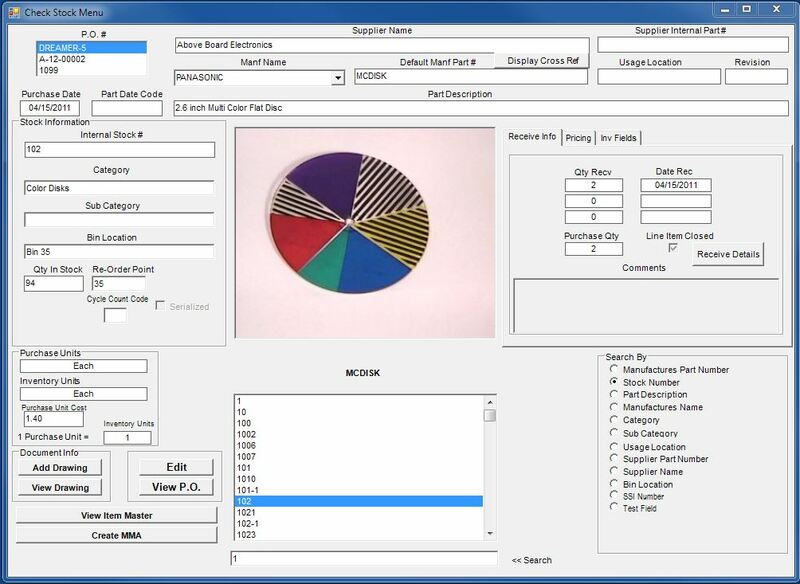 With the Bill of Material Management feature, the system will function as a full manufacturing software solution. This includes bill of material maintenance , work order processing , finding where parts are used ,advanced planning, and detailed shortage information. The Bill of Materials screen displays the stock lookup engine along with the multi-level bill of materials information. The Work Order screen displays shortage information along with the purchase order status. The Find Where Used screen displays all the assemblys that use the part along with the complete Bill of Materials. The Forecasting / Planning screen allows checking for shortages before the work order is created. These software screens have most of the features that the large corporate MRP systems have but with a much simpler user interface. Once your engineering department sees this manufacturing software in action you will look no further. It makes creating a bill of materials twice as fast with half the effort.Do not try to control the software let it control the business. Lowest Prices for Viagra - Price for 10 100 mg tablets. Compare Viagra 100 mg prices from verified online Usa pharmacies..1 review for Cheap-generic-viagra, 1.0 stars: "I place order on this website cheap-generic-viagra generic Cialis.com Received confirmation but no o..." Cialis generic..Viagra no prescription! Absolute Privacy. Bonus free pills. Private and simple orders. Top Quality Generic viagra Buy cialis..Alpha Models provides the most innovative, professional model academy in Perth buy cialis. All classes are taught by international models with extensive experience..Bright-eyed and bolstered by a rapidly growing fan base, the award winning..Good place to buy viagra - Order Viagra Online Without Prescription. Best Prices For Viagra..Canadian viagra | Buy Viagra Canada without Prescription! High quality, reliable prices! Free bonus pills..Buy Cheap Viagra. Online Pharmacy, Cheap Prices Cialis Online. We accept: Visa. Amazing weekend..NYC duo has set out to make the world of singer-songwriters a more cheerful..Listen & Study Online Viagra cheap. Listen & Study Online The Streaming Bible offers several audio Bibles to choose from Viagra Sampla. Listen and study along side the King James, NIV, WEB, ASV, Spanish and more. Interact with other members to educate and help learn God's word.